My Dad was a positive guy, and he turned the phrase around and tirelessly reiterated to me, “A good workman doesn’t blame his tools,” whenever I was tempted to blame less-than-stellar work on a saw, plane, chisel, or hammer. I grew up believing that skill was the only viable variable in craftsmanship. Well, I’m sorry Dad, but you were only partly correct. Skill can only partly offset the effects of a poorly conceived, designed, built, or tuned tool or one made of inferior materials. How can I be so unequivocal? Simple. I was predisposed to believe that skill could overcome any tool-induced obstacle. And, to some extent, I made that belief a reality for many years… or, at least I thought I did. For example, I used an off-brand, off-the-shelf jack plane for years. Over several months (really!) I spent thirty or forty cumulative hours trying to flatten the sole. Even after that torture, it was still not perfect. There was an off-center concavity along the trailing edge of the plane, but I feared that further flattening would render the sole of the plane so thin that additional warp was inevitable. I filed the frog and polished it flat. I flattened the iron and sharpened it to the finest edge I know how to obtain, and somehow made the plane work. But it was always a challenge, and I kept struggling. But with my Dad’s ever-present admonition, “Don’t blame the tool” haunting me, I trudged on. 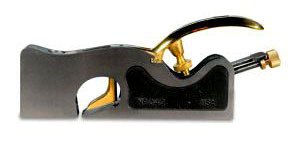 Finally I broke down, broke the bank, and ordered a premium jack plane. It was nothing less than an epiphany. Suddenly, the work was fun again. I began to wax poetic and talk to total strangers about the joys of woodworking. I was working with wood, not futzing with a cheap tool. I was Lisa Batiashvili tossing away her mass-produced violin and picking up her 1709 Engleman Stradivarius for the first time. Am I exaggerating? Well, maybe a little. But bit by precious bit, over time, I have acquired a limited “kit” of premium quality hand planes. Every time I replace a second-rate plane with a better quality plane, I ask myself, “Why did you wait so long?” Of course, the answer is always “money,” right? But if you have dithered or procrastinated up till now, do yourself a favor. Stick a crowbar in that wallet and pry out some cash for a top-notch plane, and you will soon see what I mean. You may be surprised just how good your skills really are! Recently I purchased the Lie-Nielsen Medium Shoulder Plane. This was my first non-replacement premium plane purchase. I have never owned or used a shoulder plane, but with many tenons to cut for a project, I decided to take the plunge; and rather than start with something cheap and replace it later, I reasoned that the wise investment now would be infinitely more prudent. Like you, I have cut/formed tenons almost every way possible – by hand, by router, on the table saw, the band saw, cheeks by hand and shoulders on the table saw, and a dozen other variations with countless jigs, work supports, and gadgets. From personal experience I can now confirm that the fastest, easiest, most accurate, and most enjoyable way to form a tenon is to cut it by hand and tweak it to final size with a shoulder plane. Try it, and you will soon use all those homemade tenoning jigs as kindling for the fireplace. With a lesser plane, I might be less obstreperous. But the L-N is almost a work of art. “Almost,” only because to call it such would diminish it somehow, since it is at its best when working hard, not just sitting around looking pretty (although it does that quite well, too). Check out Highland Woodworking’s YouTube channel and see the 3-part video showing how I now hand-cut tenons and use the Lie-Nielsen Medium Shoulder Plane to achieve a perfect fit. In October’s Wood News column we will explore one of several different perspectives on the potential future of hobby woodworking, build a simple bench hook, and start to mill the lumber for a desk, credenza, and bookcase to be built without a table saw (but I’ll use plenty of other power tools!). See you then!